The mediastinal nodes are a group of lymph nodes located in the thoracic cavity of the body. These nodes play an important role in the filtration of lymph before it is returned to circulatory system. The mediastinal lymph nodes are located in the region of the thoracic cavity between the lungs known as the mediastinum. There are two major groups of mediastinal lymph nodes: the anterior and posterior nodes. The anterior mediastinal lymph nodes are located posterior to the sternum and anterior to the heart. They surround the pericardium, thymus, and the major vessels of the heart. The posterior mediastinal lymph nodes are located posterior to the heart and anterior to the spinal column. They run in a vertical string along the thoracic cavity near the esophagus, trachea and aorta. Lymph is a bodily fluid that forms when blood plasma leaks through capillary walls into the body’s tissues. Lymph vessels in the tissues absorb this fluid and carry it through the lymphatic system of the body before depositing it back into the bloodstream. As lymph moves through the lymphatic system, it passes through a series of lymph nodes that filter debris from the lymph. Many particles – including dead cells, tumor cells, and bacteria – are filtered from the lymph at the lymph nodes. Macrophages living in the lymph nodes digest these cells and the body recycles the broken-down pieces. Each lymph node is a tiny spherical or bean-shaped organ. The outer covering of the lymph nodes is a fibrous capsule made of dense irregular connective tissue. The capsule gives the lymph node its shape and protects it from external damage. Lymphatic tissue fills the capsule and acts like a filter for lymph. The fibrous capsule extends into the lymph node to form partitions within the lymphatic tissue, increasing the distance that lymph must flow through the node and thereby increasing its filtration efficiency. Each lymph node is also connected to its neighboring nodes by lymphatic vessels. 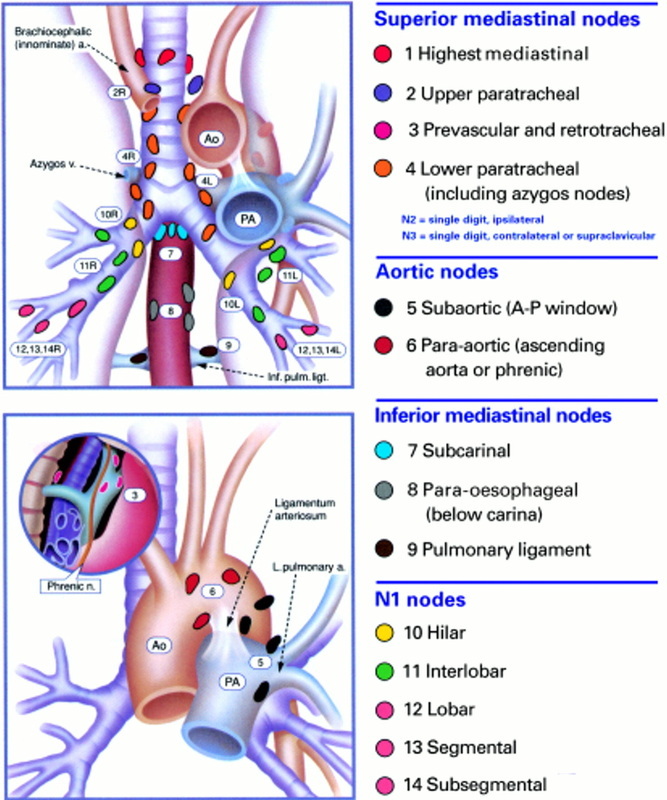 Several afferent vessels enter each lymph node from different regions of the mediastinum or from other lymph nodes. After lymph is filtered by the lymph node, it flows into an efferent lymph vessel that carries the lymph to the next lymph node in the chain and finally on to the lymphatic ducts that return lymph to the bloodstream.